Are moles and voles ruining your yard? These little critters can dig for up to 18 hours a day, which means a lot of damage to your landscape! But don’t panic, our experienced technicians can help you take back control of your yard through our mole and vole control program. 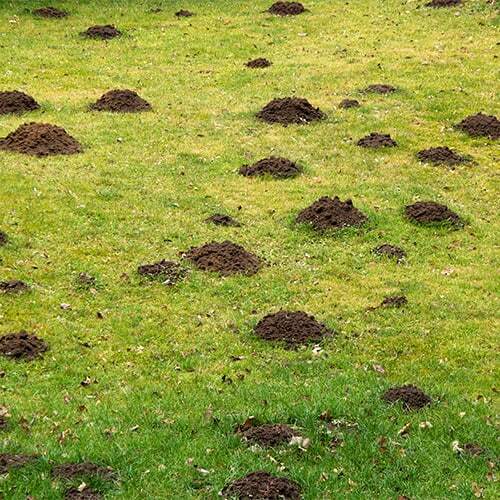 If you notice a problem with moles in your yard, call Lawn Masters for a free evaluation. After we have determined the extent of the problem, our technicians will begin a three month clean out process. Once a month, for three months, we will bait the underground mole tunnels to kill off existing moles. Our work is guaranteed for 30 days after the final treatment. The main food source for moles is earthworms, but we don’t want to kill the worms because they are beneficial to your soil. Instead, we use bait that mimics an earthworm to trick the moles into eating it. One worm contains a lethal dose for moles. 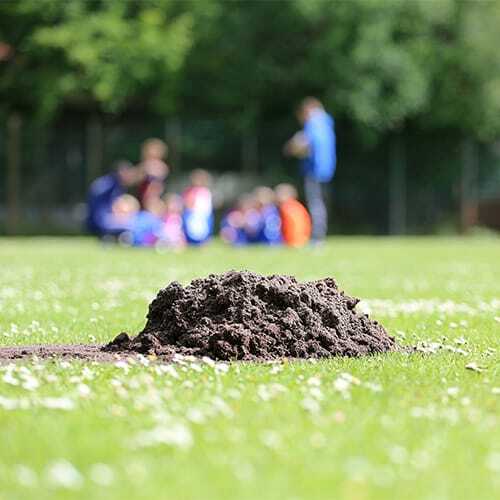 After three months, once the existing moles are gone, we suggest monthly maintenance using repellents. Moles often like to use existing tunnels from other moles, so it is easy for them to come back if you have had a mole problem before. Most of the time, it’s easy to tell if moles have invaded your yard. You will likely notice raised runs throughout your yard. During the fall, you might also notice small mounds of dirt. These appear when moles are digging deeper tunnels to prepare for the cold winter months. How can I keep moles from coming in my yard? Moles are often found on properties that border empty lots, woods, golf courses, new construction, or lakes. They also love to eat grubs, so a grub treatment may make moles less likely to come into your yard, but it doesn’t prevent them from coming back. The best way to keep moles and voles from coming to your yard is our monthly maintenance program. There are many home remedies for getting rid of moles, but none of them have really been proven to work. The moles should all be gone by the end of three months, and we guarantee our work for 30 days after the final treatment. You may start to see results sooner, depending on the severity of the infestation. If you have tried home remedies before calling our technicians, it may take the full three months because the moles may be on high alert. I want to get rid of the moles, but I don’t want to kill them. Is there anything you can do? We could use non-toxic repellent only, which would drive the moles away from your yard, but it may not be as effective. Is the bait you use safe for pets? We place the bait underground, but sometimes dogs do like to dig in the yard. Most likely, your dog would not eat the bait worms because they taste bad, or they would not eat enough to hurt them. We have been using our mole and vole control program for over 10 years now and worked on thousands of yards, and we have never had a problem with a dog getting sick from eating the bait. However, if by some chance your dog does get ahold of the bait and eat it, contact your vet for treatment.